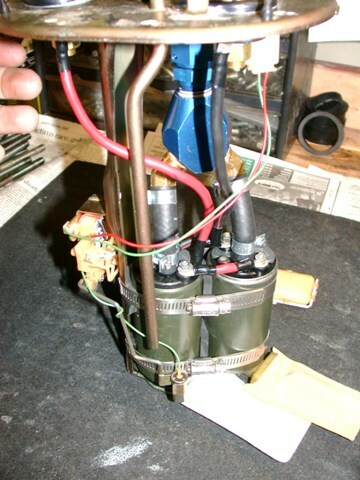 The dual fuel pump setup was constructed using a pair of Denso Supra pumps. The Supra Denso pump flows 290 lph at 43psi at 13.5 volts compared to the FD OEM Denso pump that flows 255lph at 43psi at 13.5v. Why Denso pumps and not Walbro or Bosch? I’m not convinced the Bosch and Walbro are reliable and both have a reputation for being quite noisy. I decided to stick with the tried and true Denso pump(s). To continue, one pump remains bolted to the hanger in the original location (the Supra pump is identical in shape and size to the OE FD pump). See also HERE for Supra fuel pump specs. The second pump is strapped to the first pump. Be sure to use some rubber insulators between the two pumps to minimize vibration and maintain the performance of the pumps. Be sure to have the pumps clocked at the proper angle to ensure the pump low pressure filter “sock” still fits down inside the stock baffle box. It took me a few tries to get this part right I can tell ya! That was the “easy” part taken care of. I really felt it necessary to have all the plumbing for the twin pumps to be INSIDE the tank. This minimizes the possibility of leaks from an extra set of connections outside the tank and it also means I only had to have ONE modified penetration in the tank cover for a fuel line. With that in mind, discharge from both pumps had to be plumbed to a Y connection and then through a single AN -10 bulkhead fitting in the fuel tank cover. This was a tight proposition. After several iterations I managed to find a configuration that I was comfortable with. No clearance issues and was solid. Output from the two pumps is through a short length of Gates submersible fuel line hose to a Y block using 45degree angled barbed hose fittings (from McMaster – very hard to find). It is of utmost importance to use the submersible hose. I used Gates Hose (pn H213 special ordered through NAPA which isn’t cheap at about $25 for a single foot of 3/8” diameter hose! 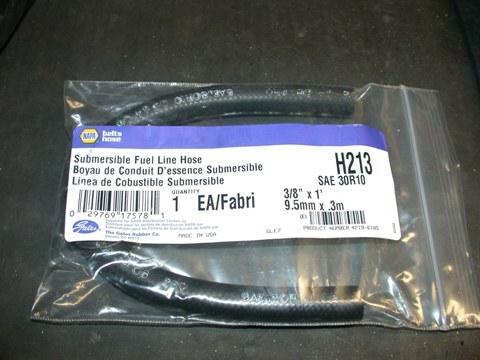 Regular fuel hose has appropriate rubber for the inner liner which carries the fuel but the outer sleeve is generic rubber not suitable for exposure to fuels. In fact, during the rebuild of my engine I had left the dual pump assembly submerged in the tank (but not bolted in place) to keep it out of the way. After 2 months I pulled the pumps only to discover the fuel hose horribly swollen and with the consistency of silly-putty. 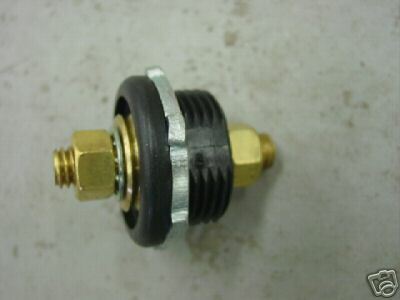 In this shape it would have been only a matter of time before the hoses deteriorated enough, combined with the pump pressure on the inside of the hose, to blow the hose completely off the pump discharge nozzle. Some other things of note; I wanted the hose connections to be reliable so I felt using proper fuel hose clamps of utmost importance. Similarly nothing should be rubbing, touching, or otherwise left to flop around. 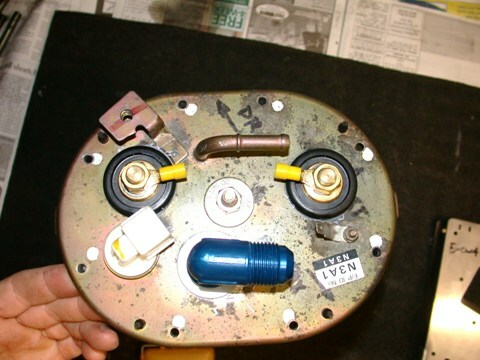 The fuel tank cover has the OE return line penetration, the single AN-10 bulkhead fitting, the OE electrical connector to keep the wiring for the fuel level sensor, and two bulkhead isolator style electrical connections for the pump wiring. All are sealed without the use of any silicone goop or epoxy compounds. This is cleaner, simpler, and much more reliable. The final dual fuel pump configuration...after the 501st try. The swollen and deteriorated high pressure fuel hose originally used. The special submersible Gates hose. Insulated electrical bulkhead connector. And as installed. 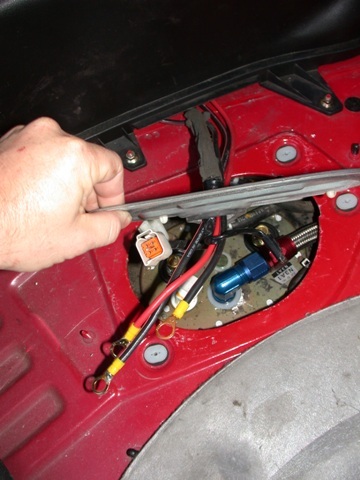 The stock fuel pump wiring is as thin as a hair and is notorious for voltage drops at the pump under load that can have a significant impact on pump performance. 12 volts direct from the battery is much preferred to the unstable voltage supplied through the factory wiring. To power the dual pumps I rewired the electrical to the pumps with 8gauge zip wire, through a 40A relay tied into the stock 12V switched wiring, and a 40A blade fuse block at the battery. Sealing the wiring penetration through the pump cover took some work and a bit of trial and error until I found thru-panel electrical connectors from Engine Works (see above). These penetrations are sealed and insulated so no vapor leakage or worries of worn wiring insulation, etc. They are a bit on the large side but they allowed me to have a separate wiring system in the tank versus out of the tank, similar to the stock connector. 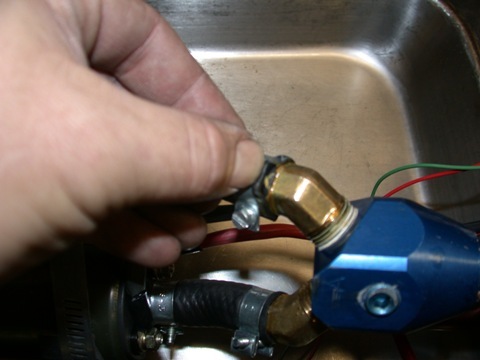 This avoids the possibility of wear on the wiring if it passes straight through the tank cover and the nasty possibility of an electrical short to the tank cover itself. I used the same wiring in the tank as I did outside the tank. In my opinion it’s kind of pointless running 8gauge wire to the tank and then using the stock “hair-thin” factory wiring in the tank. 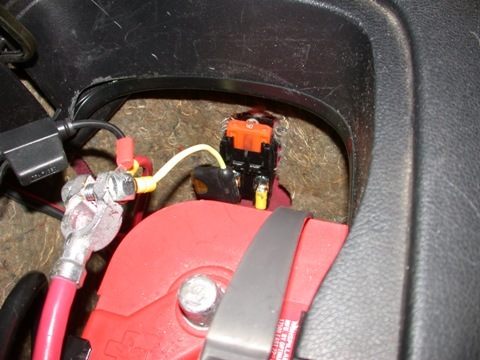 The 8 gauge wiring I used in the tank is suitably protected from wear and the ring terminals on the wiring between pumps are carefully installed to avoid unintended contact and shorts. 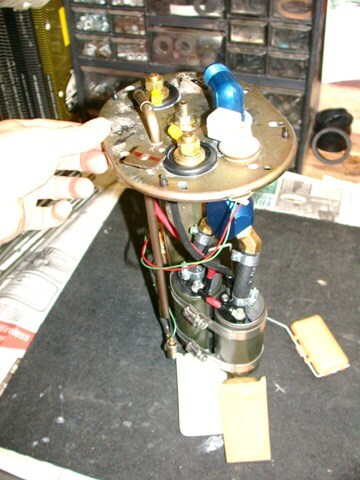 The 40A blade fuse at the battery to lead the pump wiring through to the 12v powered relay. The wiring leads through the cover plate - tank ground, pump ground, and pump hot wire. Final pump wiring and fuel lines connected. All buttoned up. Note second wiring loom for the bigger dedicated pump wiring running to the cover and the relay ground running to a chassis post. 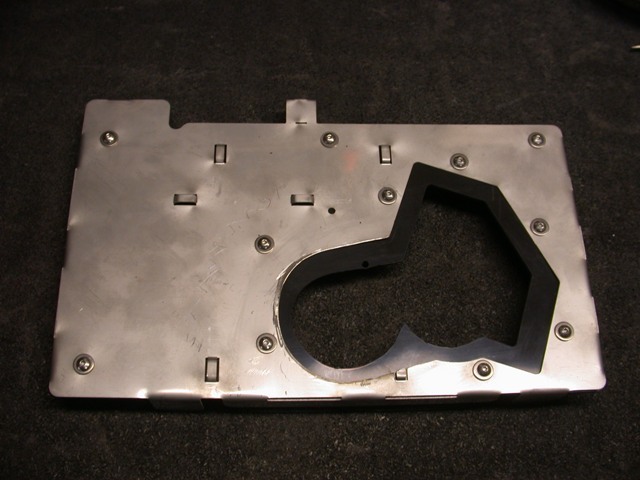 Custom cut fuel tank baffle box cover for dual fuel pumps. In addition to the dual fuel pumps I was lucky enough to receive a prototype fuel tank baffle cover from the developer, Christopher Heiser. It is unfortunate I was not able to provide any meaningful feedback to the Chris in time for production finalization but I hear great things about the cover. The solution was a long time coming. The issue was that in hard cornering the FD experiences fuel starvation at the fuel pump. Specifically, fuel housed in the stock fuel tank baffle box will slosh over the sides of the box. This lowers the actual fuel level in the baffle box and uncovers the fuel pickup resulting in fuel starvation in those high g-load corners and on hard launches with lower fuel levels in the tank. On the track, with R-compound tires, I could not drive below HALF a tank without experiencing fuel starvation in long sweeping left handers. The stock baffle box is quite effective until it is really challenged. Slap a cover on the baffle box and the fuel stays where it should….in the box. The aftermarket cover was designed for single pump users but I managed to adapt it for use with my dual pumps. Essentially the cover is strapped to the top of the OE baffle box built into the stock fuel tank. 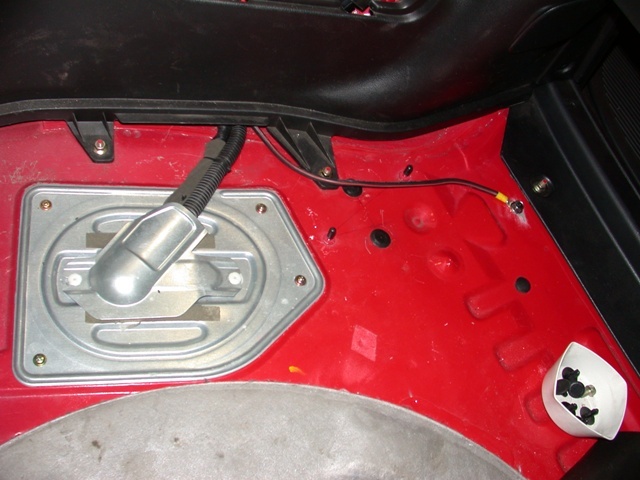 Mazda knew of the issues and provided a factory baffle box cover in ’95 on fuel tanks. 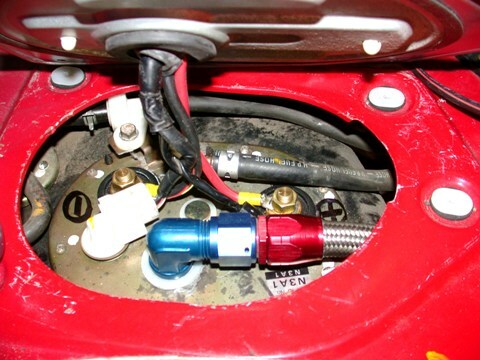 The aftermarket cover seals to the OE plastic tank by using a thick rubber gasket cut to shape to seal the gaps around the fuel pumps and between the cover itself and the baffle box. This is even better than the OE cover. It’s tricky getting the cover in the tank through the access hole but follow the fantastic instructions provided with the cover and it is very straightforward. Replacement of all turbo hoses with SS braided hose and AN fittings. 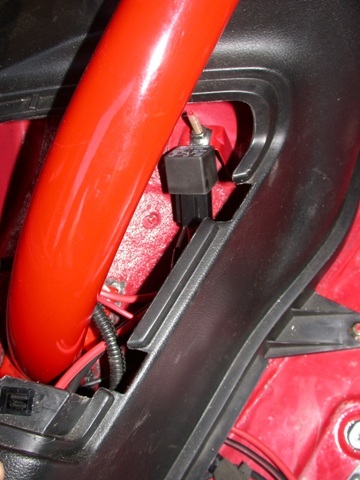 Relocation of the ignition coil packs to the drivers’ side fender wall.